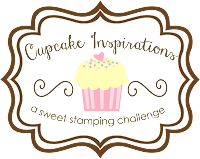 There’s a new challenge on the Cupcake Inspirations blog and it’s a color theme! Our sponsor for this challenge is Poppy Stamps and they are generously offering a $20 gift certificate to our randomly chosen winner. Link up your project and share our inspiration photo for a chance to win! Brown is not my favorite color…UNLESS, it’s spiced it up with some bold colors or patterns! Each month Club Scrap hosts monthly challenges on their Facebook group page. The Idea Deck Challenge for November 2018 is the Ace of Clubs. The Club Scrap® Page Formulas are such great tools when I need a little inspiration! Club Scrap originally sold these as a deck of cards with the cutting and assembly instructions listed on the back of each card. Now they are sold as printable .pdf files. I used the Ace of Clubs card from ALCM Idea Deck Volume 2 to create my set of gate fold cards. I love that the only thing I have to think about is picking out stamp images and complementary card stock! I used card stock, stamp images and embellishments from the new Club Scrap Gone Wild page kit. I needed some type of closure for the gate fold, so I dressed up a gold paper clip from my stash with some of the ribbon from the kit and tied on the tiny bronze binoculars. This card features Gone Wild stamp images and a cut apart from the page kit. I made the tiger cut apart into a decorative belly band closure. The lion stamp image needed a little something, so I added some Stickles to make his eyes glow! I used matching brads from my stash and waxed linen thread to create a tie closure for this card. The bronze giraffe dangles from the end that unwinds. I used more Gone Wild cut aparts for this card. I trimmed the giraffe image to fit the blue panel and fussy cut the sentiment cut apart for interest. I made a simple belly band from one of the scraps I had left and added some Stickles for bling. Click HERE to see what the rest of the Design Sweeties have created for this challenge and link up your “shades of brown” creation for a chance to win! I’ll look for you in our gallery! Previous Post Happy Fall Ya’ll! These are so awesome, Wendy! I love all of the little details that make each card special. Way to go! Thanks Karen! That means a lot. Beautiful, Wendy! Two of those would be perfect sentiments for Safelight cards.